Several months later the donuts are still selling in big numbers, though people call ahead – the phone rings twice in a few minutes with inquiries – and bulk orders come from local companies such as Ford and Holden; an architect in Melbourne city wanted 300 not so long ago. The donuts are delivered at 6.30 each morning, and Jimmy Othman and his wife, Zena Samia, are up packing them into boxes for the orders. He prefers not to publicise how many they’re selling now: “Numbers are very dangerous,” he says, nodding towards the street outside. When you multiply the numbers by $3, you see why: it’s still a working-class neighbourhood where not everyone is working. That’s a lot of donuts, though not as many as the 3000 he says they sold in one day at the height of Melbourne’s Nutella donut bubble in early 2015. “It’s like a dream…” Jimmy says, and you picture donut-money raining gently on the brown tile roofs of the suburb. Jimmy and Zena lived in Dubai for five years until she got homesick for Australia. He couldn’t find an engineering job in Melbourne, so they took over the deli from Zena’s parents (she grew up in the house behind the shop). Then the donut thing happened. “It’s like a dream…” Jimmy says, and you picture donut-money raining gently on the brown tile roofs of the suburb. 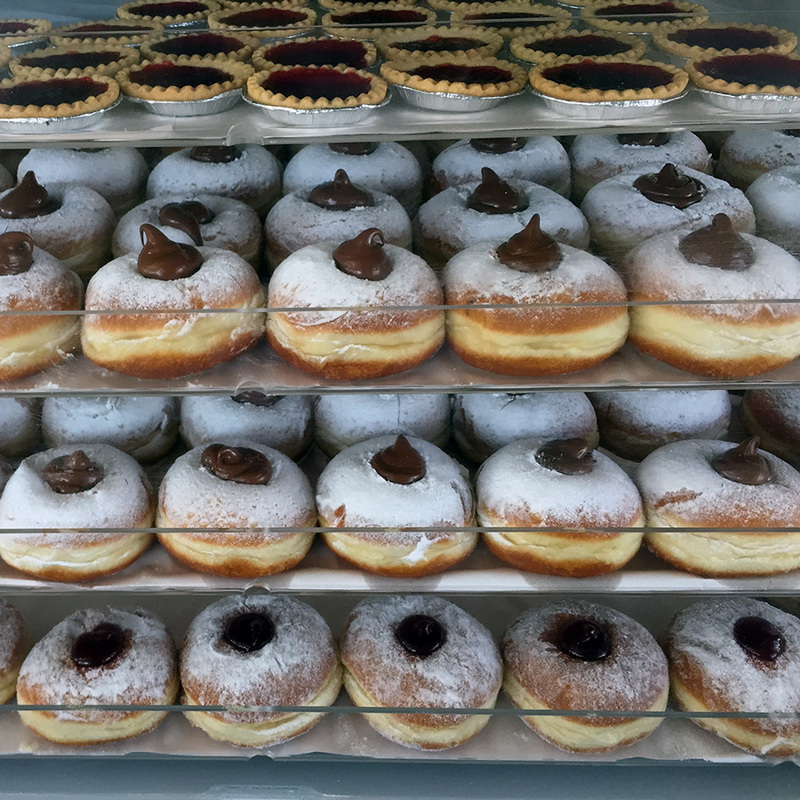 The donuts are displayed in a perspex case on the counter, just a couple of dozen: Nutella, custard, jam. They’re big, the dough is soft and pillowy, and they’re well dusted with icing sugar. The Nutella – thanks to the microwave – is warm and runny, and they are impossible to eat politely while Jimmy watches. Jimmy puts the craze down to word of mouth – especially on Facebook, where Jimmy’s Place now has 5300 likes.“People tell other people and they want to try them,” he says. The page features photos of donuts, a weekly update – “Donuts ready now!! !” – and nothing much else. “I know my food, and these donuts are good. Fresh ingredients, no preservatives. When I get the first delivery in the morning the smell is very tempting. I can’t resist,” Jimmy says. 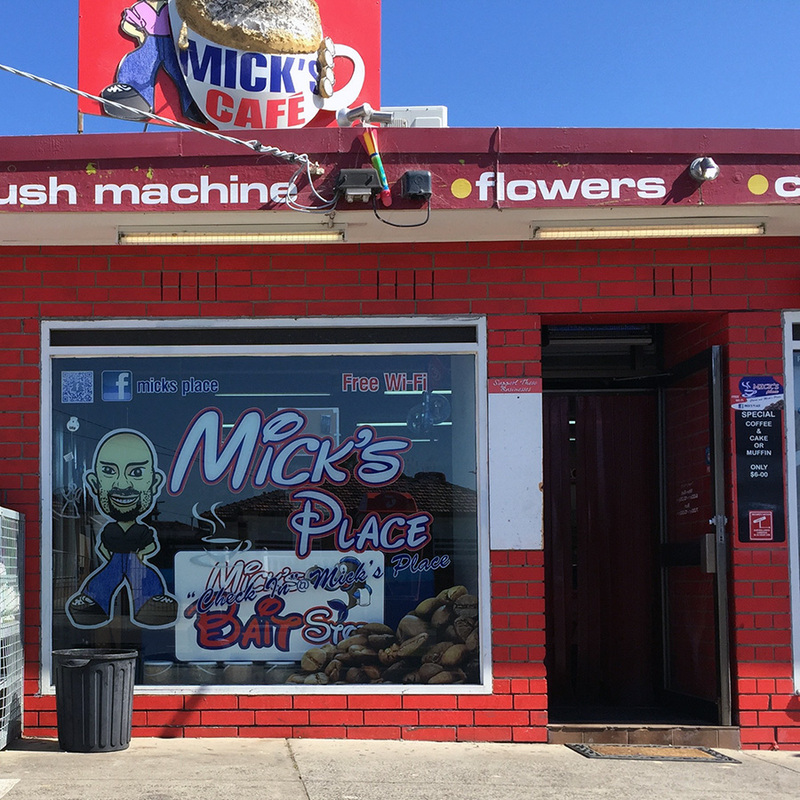 A few kilometres north, across the ring road that divides Melbourne’s inner and outer northern suburbs, is Mick’s Place in Thomastown. Mick Solomon is Jimmy’s brother-in-law, and the same week that Fairfax Media’s Good Food website broke the story of the donut craze at Jimmy’s, the local newspaper in Thomastown reported that Mick’s was selling up to 4000 donutellas (as he calls them) a day, including 4300 one Sunday. Mick’s Place is a low brick building painted fire-engine red that sits on its own suburban corner surrounded by car parking spaces. The coffee comes in takeaway cups even if you’re having it at one of the umbrella-shaded tables out front. A young Lebanese-Australian guy pulls up in a silver BMW and gives himself a spritz of cologne before he goes inside (the counter girl, a family friend of Mick’s, is cute). 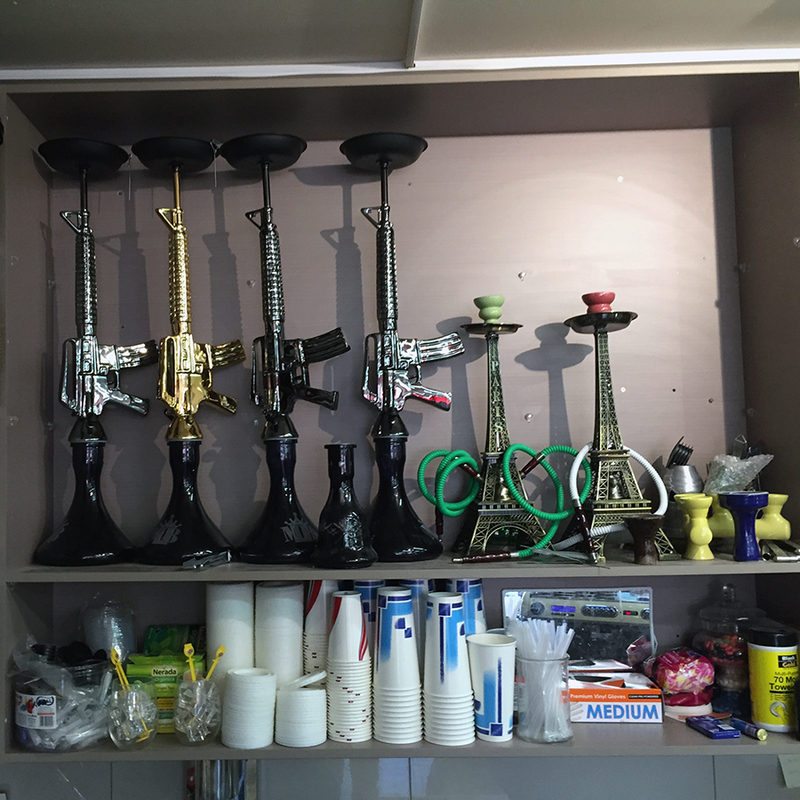 One shelf displays shisha pipes – including several modelled on an AK-47 assault rifle; you picture Lebanese-Australian youth laughing as they take hits of fruit-flavoured smoke from the barrel of the assault rifle like stoner Vietnam GIs. The donuts are in a perspex display case here, too, though there are several dozen, taking up most of the counter, and in more flavours than at Jimmy’s. Mick’s not in – he’s too busy, says the counter girl with an enigmatic smile. She serves the espresso in a takeaway cup, and the donut is similar to Jimmy’s: soft dough, loads of icing sugar, a mouth-clogging dose of Nutella inside. Around the time that Melbourne’s newspapers were reporting on Jimmy’s and Mick’s donut explosion, signs appeared at high-street bakeries and ordinary cafes all over town: WE HAVE NUTELLA DONUTS. You saw them outside Vietnamese hot bread shops stacked in perspex display boxes, and at suburban cafes that doubled as feral tattoo parlours. 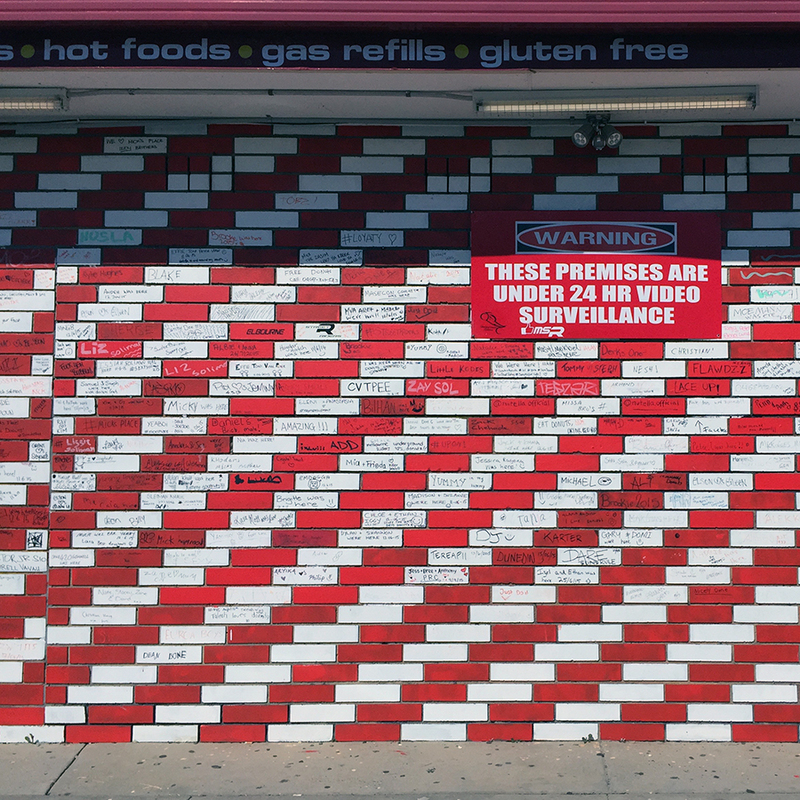 An anonymous cafe in Glenhuntly Road, Elsternwick – a south-side neighbourhood with a big Jewish population that’s famous for its bagel shops –had a sign and a tray full in the coffee hatch: they came, said the young barista, from a bakery in Derrimut, way out in the badlands of Melbourne’s industrial western suburbs. Cafe Tre Fontane, a tiny Italian-Australian espresso bar in Ivanhoe, a green middle suburb that’s home to one of Melbourne’s most desirable private schools, was making their own in-house. The story was repeated across Melbourne: NUTELLA DONUTS HERE. Mick’s donuts came from Il Forno Ciabattaria, a bakery in the quiet back streets of Reservoir. Reservoir (you say it “reservaw” if you’re a real northsider) is another flatland suburb full of orange brick bungalows built by postwar migrants; many feature high brick walls surmounted by eagles (people from the Abruzzo) or fake Corinthian columns. What about Jimmy’s? Where do his come from? “I think he was getting some from Mick’s,” he says. He is reluctant to speculate. There’s an edge, though he won’t elaborate. As he talks a truck arrives to pick up a stack of donut crates – 500 in all, heading for a food truck. Il Forno has been making the Nutella donuts for at least four years, he says. Capello’s business partner saw bomboloni filled with Nutella on a trip to Italy, and thought they should give them a go. “They took off in April or May.” It was Facebook and Instagram that did it: “People got on board, there was a bit of a frenzy. Something new, something different,” he says. The appeal is “all in the bun. The process, the ingredients. All natural,” he says. His donuts are made from simple ingredients: “flour, water and that” – he’s a businessman, not a baker. They get a quick fry, and then the Nutella is piped in by a machine. The finishing splodge on top is added by hand. At the height of the craze, he had two workers adding splodges all day. “When you look at the amount of Nutella, it’s pretty good value,” says Carlo Cappello. In August 2015 Carlo Cappello even claimed responsibility for an Australia-wide shortage of Nutella, telling one local newspaper that he was going through 600 kilos a week, exhausting the country’s stock of caterers-size 3-kilogram tubs and sparking a scramble for the smaller domestic jars. Also on display at Il Forno are donuts filled with the more traditional Italian baker’s custard, crema pasticcera. They cost $4.50, while the Nutellas are just $3. “When you look at the amount of Nutella, it’s pretty good value,” says Carlo Cappello. The Nutella donut is the 21st-century offspring of custard-filled bomboloni that came from places like Pasticceria San Giusto, which stood for half a century in Lygon Street, East Brunswick, an old working-class neighbourhood in Melbourne’s inner north full of tiny terrace houses that Italian migrants colonised while they were earning the money to build their brick palazzi further north. San Giusto was a little bakery with a wood-panelled front room and a counter where a couple of dozen pastries were displayed at a time: cornetto alla marmellata and bomboloni filled with vanilla custard were the best. Orlando Artavilla, who now owns Candied Bakery in Spotswood with his partner, Toula Ploumidis, bought San Giusto in 2004 and converted it into bakery cafe Sugardough as the neighbourhood was gentrifying. “We took over the bomboloni recipe,” he says. “But we did them with Nutella. We also did cornetti with Nutella” – way back in 2004. Soon, he says, “We thought, Why are we doubling up on the Nutella in the donuts and the croissants?” They switched to chocolate ganache for the bomboloni. Today Sugardough’s bomboloni have a dense, almost bread-like crumb compared to the lighter, spongier donutellas. They’re still filled with chocolate ganache, still have a little of the yellow colour and that sort-of-vanilla aroma of Italian pastries, and they cost just $3.20 a piece. Orlando Artavilla also did a Nutella donut at Candied Bakery when they first opened, and now occasionally does a Valrhona chocolate custard. Spotswood is another former working-class neighbourhood that’s gentrifying fast. At bakeries that take a more artisanal approach, such as Tivoli Road Bakery in South Yarra, a wealthy neighbourhood on the south side of the Yarra River, which divides Melbourne neatly in two, the bomboloni-style donuts are smaller than the northside donutellas – an orange to their grapefruit – and the dough is a denser, slow-rise type. Tivoli’s English owner and pastry cook Michael James says it takes nearly three days to make his donuts, including 24 hours for the dough to ferment and another night for it to prove. Early each morning the dough is cut and shaped by hand and the donuts fried 16 or 18 at a time at 180C, drained and rolled in sugar. The dough is made with flour, water and yeast plus ferment (leftover dough from other bread and pastry-making). The long fermentation and overnight proving give Tivoli’s and similar donuts “much more flavour and a softer, spongier crumb,” says James. The Tivoli donuts are $4 each – about par compared with similar donuts from other artisan bakers such as Yarraville’s Cobb Lane, Candied Bakery or even the hipster donut sensation Short Stop in Melbourne city. James sells 100 on a weekday, and up to 300 on Sundays. So to sell 3000 donuts in a day at a suburban milk bar really is something almost unbelievable: that’s more than 200 an hour for 14 hours, or three-and-a-half a minute. It barely sounds possible. People must have been carting them off by the dozen. And in fact, back at Mick’s Place, there’s a stack of boxes that would hold a dozen donuts, all labelled “Mick’s Donuts” with home-printed stickers bearing a caricature of Mick, a big, dark-looking guy. But there’s no sign of Mick. Mick also has loads of fans online. His Facebook page has more than 20,000 likes. He recently ran a competition with a prize of free donuts for a year – to enter, you had to like the page and follow Mick’s on Instagram (he has 6400 followers). In the end he gave away two prizes of a year’s supply of donuts. A week later Mick finally calls and makes a time to talk. When I arrive, he comes out of the back room behind the shop, where he’s been sleeping, and you get the feeling he has been there the whole time – something in the counter girl’s smile, covering for him. He is a big guy with a gruff voice and the Australian accent that betrays him as Melbourne Lebanese. He takes a seat under the umbrellas out front. His gold iPhone has the trademark cracked screen. He talks in a low whisper, fast and hard to hear. So how did he go from corner store to donut king? “I wouldn’t say donut king,” he says. I switched the jam for Nutella myself. We just piped it on top – we weren’t actually injecting them. “I was selling just a couple a day. I switched the jam for Nutella myself. We just piped it on top – we weren’t actually injecting them. One of them came back: Mick’s was the only shop in the area. “There’s no bakery here sweetheart,” said Mick. Are they Nutella donuts, she asked. Yes. She said, “Can I buy all of them – there were four left – and can I place an order for tomorrow.” She wanted a dozen. 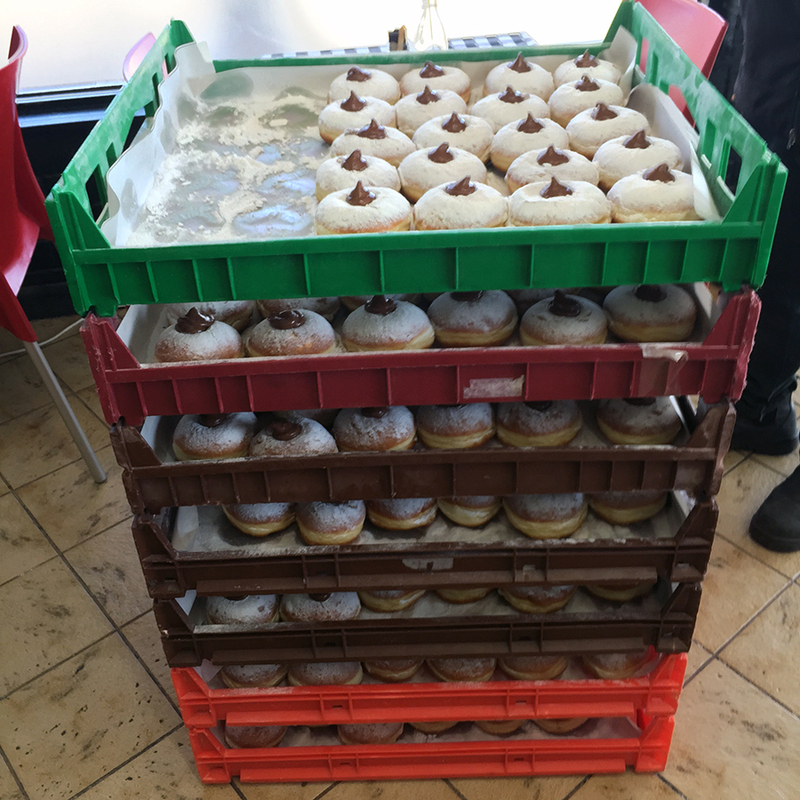 The person in the line behind the woman wanted a dozen as well, and so did other people – suddenly Mick Solomon had orders for 130 Nutella donuts for the next day. He insisted on prepayment. The donutella’s fame (a name Solomon says he came up with in a customer competition) spread from there – and not just around Melbourne. As Mick Solomon talks there’s a steady trickle of people coming out of the shop with Mick’s Donuts boxes and loading them into their cars – six, a dozen, two dozen. It became a Solomon family production: his father folding boxes, his daughter printing the Mick’s Place labels, his son folding boxes too. At one point people started bringing donuts back that they had bought at other stores, asking for a refund – they weren’t as good as expected. “I rang around and found they were all over the place,” he says: other stores were passing inferior versions of the donutella off as Mick’s Donuts. “It didn’t really bother me. I’m not some entrepreneurial donut king. But I’m refunding these people’s money and I don’t know where they’ve bought them from. It was so busy in here, and we weren’t really prepared for it. Locals coming in for milk and cigarettes were getting caught up in the frenzy, too. “I told them, Just take your milk. Don’t worry about it. We’ll fix it up later.” Mick’s is that kind of place: he knows most of his customers, and at one point pauses to exchange a few words in Arabic with a young man. “I was also avoiding journalists … we spoke about something and they published something else. Triple M (a local FM radio station) came down and she was awesome. An absolute legend of a person. I was inside sleeping. A shorter version of this story first appeared in The Age’s Epicure Good Food section.